You’ve probably heard quite a bit about forex if you’ve been looking for new and innovative ways to make more money. It’s an increasingly popular endeavour, but if you’re a busy person, with little time to sit down at a desk and crunch some numbers, you might have been put off. Fortunately, you don’t actually need to sit for hours at a computer to be successful. 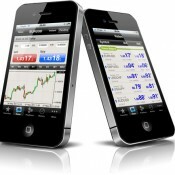 A great many brokers now offer mobile applications, so that you can trade while you’re on the go. The most popular app is probably MetaTrader 4 Mobile, which is compatible with the majority of forex brokers. It’s essentially a cut down, mobile optimised version of the full piece of software, and is ideally suited to your smartphone or tablet. You can monitor your account, watch price action, and make trades from anywhere with an app like this. All you need is an internet connection, and you’re away. It’s important to remember that mobile applications are best used in conjunction with the full programme, simply because tablets, and especially smartphones, can’t always display all of the data that you might need on a chart. It’s great to be able to touch and move charts on the screen, but sometimes a larger display is easier. This isn’t to say you can’t do the majority of your trading on a mobile app, you should just be aware that sometimes you might need a computer. Most platforms are free, including mobile ones, so you’re able to choose whichever one suits you best. There are benefits and drawbacks associated with anything, so trying out a free demo account might be a good idea. Most brokers will offer this with their mobile apps. This is actually a great way of learning, because you’ll be able to try out all of the different products without risking any of your own money. Binary trading is one of the newer products, and its short duration and accessibility means that it is ideally suited to trading on the go. Make sure you find pro binary signals before you begin to trade; you want to give yourself the best chance of turning a profit. To conclude, if you want to get involved in forex, but don’t have the time to sit down at a desk for several hours a day, then mobile trading could be for you.